Approx. 18" from handle to handle . Across the top it measures approx. 14.5" x 11" x 3" high. The measurements at the base/bottom of the dish are approx. 12" x 8.25"
*Each Item is certified to bake up to 480 degrees and will make everything you cook a work of art! 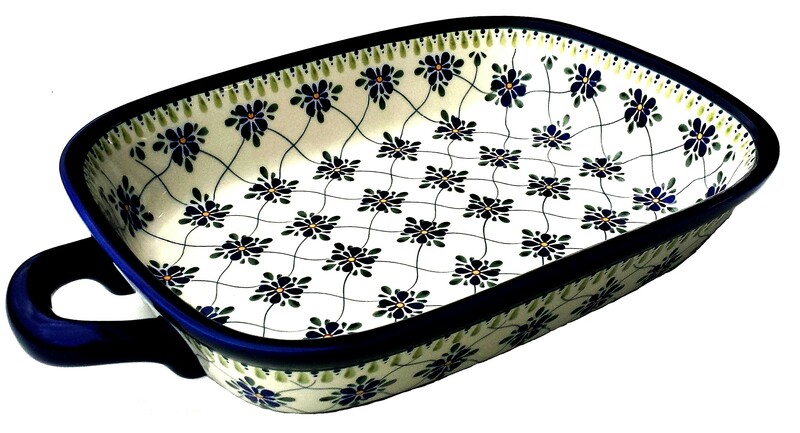 *Stoneware must be room temperature prior to use in a microwave or hot oven. Avoid drastic temperature swings. *Do not put close to the heat source such as the broiler or bottom of the oven. Approx. 18" from handle to handle .Across the top it measures approx. 14.5" x 11" x 3" high. The measurements at the base/bottom of the dish are approx. 12" x 8.25"
Dimension: Approx 18" from handle to handle . Across the top it measures approx. 14" x 11" x 3" high. The measurements at the base/bottom of the dish are approx. 12" x 8.25"